It’s official, Viola Davis has made one step forward for diversity in television, and one giant leap forward for women in entertainment in general. 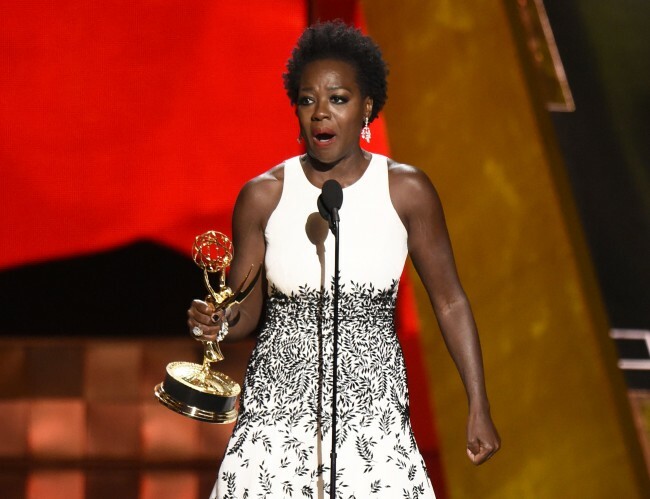 Over the weekend she won the Emmy for Outstanding Lead Actress in a Drama Series for her role as Annalise Keating on ‘How To Get Away With Murder’. She became the first black woman to win this prestigious title and there could be no one more deserving. It should be noted that Taraji P. Henson who plays Cookie Lyon in ‘Empire’ was also nominated which meant the odds were good for one woman of color to take home the prize. It was a moment that was widely celebrated in the media, by audiences and of course within the industry. 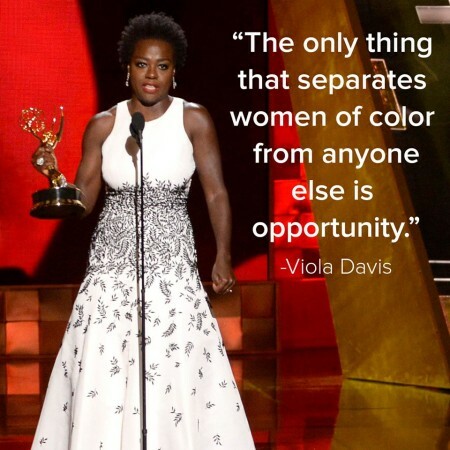 Similar to her SAG Award win early in 2015, Viola took the opportunity to use her victory speech platform to share why diversity is not just a great idea, it is an important part of the entertainment industry because of how it influences audiences. That’s right, no one can win any awards for roles that don’t exist, and as a trickle-down effect, young girls and women can’t think of themselves as normal if the dominant message they get from the media is that you have to fit into one narrow standard of beauty and one specific definition of what a woman is supposed to look like. Before the Emmys, Viola spoke at the National Women’s History Museum’s fourth annual Women Making History Brunch in Los Angeles, and told the women in attendance that even her nomination was a sign of something far more significant than an accolade for her acting chops. “It’s the impact of my work, I think art matters. I have to continue that whether I have the statue in my hand or not,” she said to the star-studded crowd. She acknowledged the impact of actresses like herself and a handful of others who are playing award-winning lead roles now, some of which would not be possible had someone like Shonda Rhimes not come along and prove to a major network like ABC that women of color, and LGBTQ characters are also ratings winners just as much as the next straight, white male character. When those who are previously marginalized, stereotyped and sidelined finally get that opportunity to be complex, real and lead a story, all of a sudden there are new possibilities. Speaking of which, we have shared in the past how opportunities for women in television both in front of and behind the camera are more apparent than in film. Which is why a handful of more important categories awarded to certain women were indicative of what is possible. Jill Soloway, creator, writer and executive producer of ‘Transparent’ who won a Golden Globe, took home the award for Outstanding Direction for a Comedy Series, and understands the gravitas of what a show like hers is doing to challenge societal boundaries. “Sometimes culture starts and then politics follow,” she said about how conversations about the transgender community are forcing us to have a greater understanding and allow audiences to have first-hand glimpse into what trans folk go through, given that the show is based on Jill’s personal family experiences. HBO’s series ‘Oliver Kitteridge’ won big on the night with 6 Emmys total, and also gave out two crucial awards to women. Jane Anderson won Best Writing for a Limited Series, Movie or Dramatic Special for her work on ‘Oliver Kitteridge’, and Lisa Cholodenko won Best Directing for Limited Series, Movie or Dramatic Special. For women to win writing and directing awards is a big freakin’ deal, let’s make that clear! According to an analysis by the Women’s Media Center of a decade’s worth of Emmy Awards data, only 22 percent of nominations for writing, directing, producing, and editing have gone to women in the past decade. This year, 25 percent of nominations recognized women, reports the Christian Science Monitor. Julie Burton who oversaw the study for the WMC said the low numbers of Emmy nominations reflect the numbers of women hired to work in non-acting jobs. Prime-time television shows in the past year hired women as 26 percent of executive producers, 38 percent of producers, 26 percent of writers, 14 percent of directors, and 21 percent of editors, reports the Women’s Media Center. Another woman who showed the power of barrier breaking was comedian Amy Schumer who was nominated in four categories! She won the award for Best Variety Sketch for her badass Comedy Central series ‘Inside Amy Schumer’ and hilariously thanked the makeup artist who did a smokey eye on her on the night. Her win was not just an accolade for herself, but also a win for women in comedy everywhere. Go Amy! We’d also like to give props to ‘Orange Is The New Black’s Uzo Aduba who won her second Emmy Award, this year it was for Outstanding Support Actress in a Drama Series, last year it was for Guest Actress. Why do we love her winning yet again? Because she has shared in previous interviews what a struggle it was to even get to where she was today as an actress. In fact the day she found out she snagged the role of Crazy Eyes on the show, was also the day she had decided to give up acting. Nothing was happening for her and she had made the decision to go back to law school and found herself on a train going home crying at how appallingly her acting career had been going…or so she thought. In her tearful speech she thanked Jenji Kohan, the executive producer of OITNB, for giving her this opportunity and it was clear to everyone watching and in the audience what this role meant to her. She is living proof that sometimes the best opportunities come in the most unexpected ways and times, but the fact that someone gave her that opportunity in the first place made all the difference. All in all it was a positive night which exhibited a number of signs of cracks in the ceiling that have previously prevented women from making great entertainment in ways that men have been allowed to since the inception of television. We believe it is important for us to point out the female trailblazers along the way who make unknown paths possible (and damn successful!) in order to give hope to all the filmmakers, writers, producers, actors and directors who have been told that their gender, their skin color, their age or their sexuality will not allow them to be successful. So kudos to the women like Shonda Rhimes and Jenji Kohan for giving women like Viola Davis and Uzo Aduba a platform which gives home to other people of color, and shoutout to the women like Amy Schumer who are showing critics over and over again that women in comedy are a force to be reckoned with. Finally, let’s give it up for host Andy Samberg, who, in his opening monologue, dared to talk about diversity, racism and reiterate why the television industry has a responsibility to create accurate and meaningful representatives of audiences everywhere.